Information about Meucci Cues. Meucci pool cue valuations, Meucci cue identification, etc., including a listing of all Meucci pool cues which can be used to research old Meucci Cues or identify a Meucci pool cue. 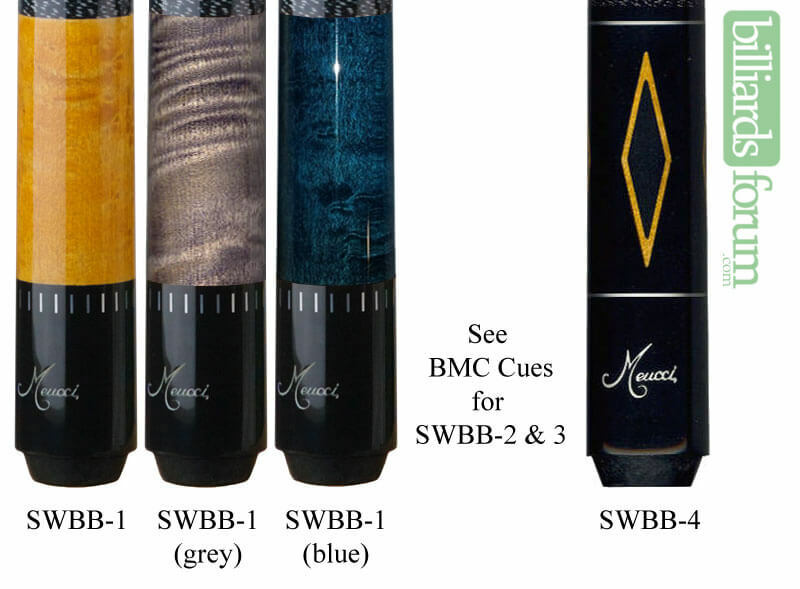 A historical database and listing of Meucci pool cue model numbers and other information about Meucci Cues. Below is an archive of Meucci cues. You'll find retired Meucci cues as well as current Meucci cue series, and one-off custom Meucci Cues. Below is a list of custom Meucci Cues or one-off products which don't belong to a specific product line. Meucci Cues Logos. Past and current Meucci Cues logos, marks, symbols, and identifiers. A logo from Meucci Cues brand pool cues website. This Meucci logo was used on the Meucci Cues website for about 10 years. A custom Meucci logo from Meucci, Inc. This Meucci logo was custom made, and has the text "The Worlds Finest Pool Cues". A large logo from Meucci Cues brand pool cues. This Meucci logo is a standard maroon colored Meucci logo. It began use in the 1990s and is still being used today. A Meucci logo from Meucci, Inc. Meucci is a maker of pool cues, also known as Meucci Cues. This Meucci logo is their newest logo, which was used from the 1990s to present. A logo from Meucci Originals in Olive Branch, MS, circa 1976. A very early logo from Meucci Originals in Olive Branch, MS, circa 1985. There are many Meucci pool cues which were never photographed that were made for Larry Hubbart, Earl Strickland, Buddy Hall, Mike Siegel, Jim Rempe, Loree Jon, Louie Roberts, Nick Varner, David Howard, Howard Vickery, Tom Kennedy, Minnesota Fats, and Willie Mosconi. Most world champion pool players have played with Meucci pool cues at one time or another and many had one-of-a-kind designs. Bob Meucci has built cues for famous movie stars, singers and celebrties; such as, the Prince of Brunei, Micheal Jordan, Julian Lennon, etc.. Even Donald Trump stated one of the top items of his Christmas wish list was The Taj Mahal Pool Cue by Meucci Cues, which sold in excess of 100,000. In 2017, in season 1, episode 3 of "Ronnie O'Sullivan's American Hustle" (History Channel), Ronnie O'Sullivan and Matt Smith visit the Meucci Factory for a tour, which ended up as a four-and-a-half minute segment in the episode. These cues are designed and developed by Bob Meucci, and offer a tremendous value. The Meucci line of pool cues play with a softer, more consistent hit, which reduces cue ball deflection. Additionally, these pool sticks are built with one priority in mind... and that's to give every player more power with less effort. Its been well-documented that the choice of a high-quality pool cue can make a significant difference in the consistency and level of play of a billiards player over time. Typically, you would expect to pay anywhere between $100 - $3000 for a intermediate-to-professional grade cue, however the most expensive cues might not provide you with any additional "playability" benefits than a lower priced pool stick. Meucci cues provide a very affordable pool cue, that gives you all the features you need, but none you don't. Meucci is probably the best known, legendary pool cue brand available today. Why? Because Bob Meucci has been building the most aesthetically pleasing and technologically advanced pool cues since the mid 1960's. Meucci pool cues had more professional and semi-pro players than any other manufacturer in the late 1970's and 1980's. With their popularity at an all time high, 70 percent of all professional money won in tournaments was won with a Meucci pool cue. In the late 1990's Bob Meucci developed the testing robot, "The Myth Destroyer" to test cue ball speed and deflection. Even today, Meucci pool cues continue upgrading and testing their cue shafts and this is why they are one of the leading choices of many players. Located in Byhalia Mississippi, if visiting the Meucci Factory today, you will find that the old world craftsmanship is still alive and well in the United States. For half a century, Meucci has been celebrated for building the most beautiful pool cues on the market and making their works of art perform with more power with less effort. 1963-1971 - Chicago area north suburbs as BMC Cues. 2006-Present - Byhalia, MS. This is our current location. 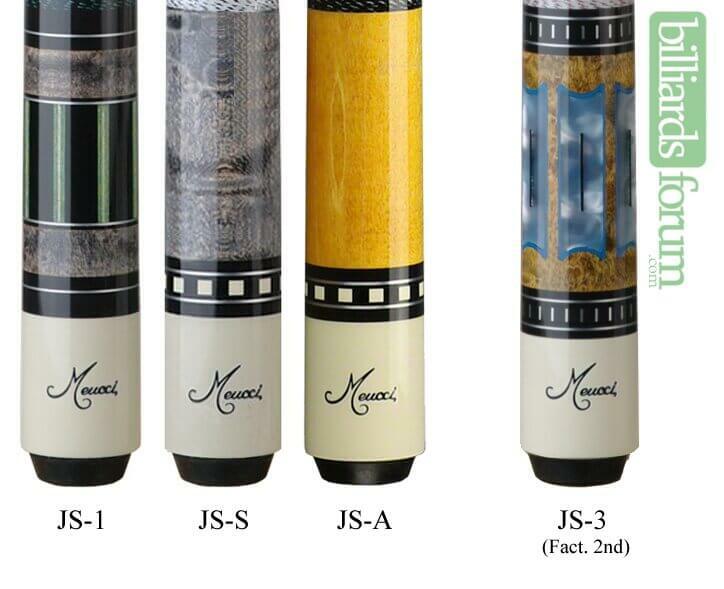 Meucci [branded] Cues have NEVER been made in China, which has been falsely stated on AZB. FYI-In the last 42 months, Meucci Cues have won more prize money and more tournaments than all other brands put together, and that includes the so called custom cues that in some cases are just assembled from parts bought from suppliers, blanks, joints, joint rings, etc... We at Meucci make it all from raw stock, making us one of the only true custom cue makers. Bonus FYI - Who are the players that are doing all the aforementioned winning you ask? Well, I'll be happy to tell you; how about this list? Loree Jon Hasson, Jayson Shaw, Dennis Orcollo, Skyler Woodward, Chris Lawson, Mike Massey, Max Eberle, Kevin Cheng, Corey Deuel, Devin Poteet, Dennis Hatch....the list goes on, my apologies if I left someone out. These players are going out with our cues and winning-not with specially modified one off cues, but cues just like the ones that can be purchased by anyone-our cues are built to perform, and each one is built that way-they aren't assembled and then over-modified to make them perform-we build each one of them to perform, and that's what they do. What was said in the past is still true to this day - One Ball Better. Questions about Meucci pool cues? Something not quite correct or some info missing? Let us know using the form below.